Freya, Goddess of love and war, goes into the light. 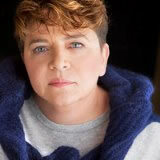 Freya waited in line, pulling her tattered grey cashmere poncho closer to her. The sun had almost completely set and the night brought with it the cold that she felt now more than before. The young people handing out old backpacks and purses were still smiling and Freya envied their stamina. When it was her turn, the blonde teenager handed her a bag, but Freya shook her head. “I want that one please,” she said pointing to a fringed black leather and brass-studded purse over to the side. “No problem,” he said, reaching over and handing it to her. “Happy Holidays!” he said brightly. “To you as well.” Freya doubted he had heard her, but she didn’t care about things like that anymore. She made her way down Park Street and crossed Coast Highway to Main Beach. She walked towards the water and sat down in the cold sand, then took off her shoes and let her feet sink in. Freya put the purse down in front of her and opened it. She took out the assorted toiletry items and snack foods and laid them out in an arc. She waved her hand and the objects dissolved into the tiny grains of sand. 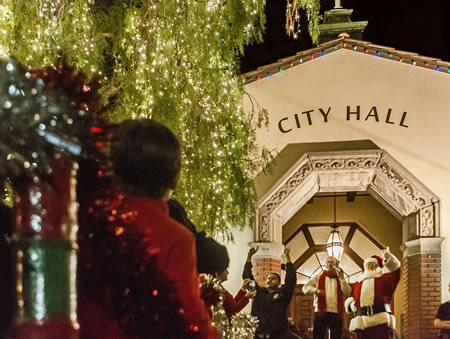 Laguna’s downtown glows in holiday raiment. She looked up into the fully darkened sky. Freya closed her grey eyes and felt the pull of the sun on the earth. Taking a breath, she willed it to swing back from that darkest and coldest point on its ellipsis. Freya felt the same moment of hesitation she always felt before the very slight, almost imperceptible wobble of the earth being pulled back made her breathe easier. Reaching into the purse one final time, she found what she was searching for. A single grey paper napkin, a slight smear of lingonberry jam in the corner. 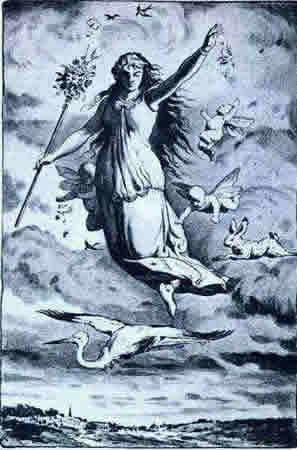 Freya smiled at the memory of that solstice evening so very long ago. She and Odin had eaten together at Scandia Bakery, where she had taken a dozen or so paper napkins, shopped for her grey poncho at Muse, and walked together along Broadway. Freya remembered how much she had enjoyed the lights, the soft lighting of the storefronts and the sharper points of lights seeping from incandescent bulbs. Odin was gone now, like most of the other old gods. She took the napkin and stood up. She closed her eyes and thought about light. Not just that from the stars in the sky, but the brighter one beyond that. It filled her at that moment. As she let go of the napkin, now a gorgeous grey swan lifting itself higher into the sky, she felt the earth continue spinning forward on its path back to the sun. She found the light again, and this time, she walked into it. Rina Palumbo is a writer who lives and works in Laguna Beach. She is still in search of the perfect lingonberry tart.